Laura and I are deeply saddened to learn of the passing of your dear father. Our hearts ache for you, and our prayers are with you. Sargent Shriver was a kind and compassionate man who dedicated his life to serving others. 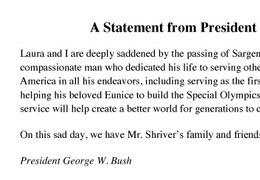 He represented the very best of America in all his endeavors, including serving as the first director of the Peace Corps and helping your sweet mother build the Special Olympics movement. His remarkable legacy of service will help create a better world for generations to come. Laura and I will pray for your family's strength and comfort as you celebrate your dad's life and mourn the loss of someone who meant so much. May God bless you.